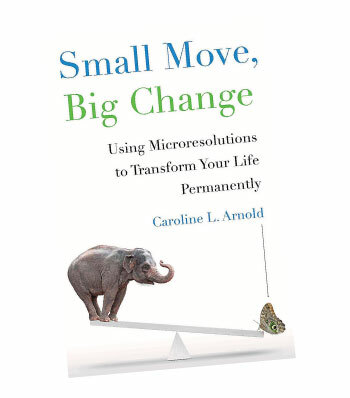 Eighty eight per cent of us fail to see our New Year resolutions through, writes Caroline L. Arnold in her latest book Small Move, Big Change: Using Microresolutions to Transform Your Life Permanently. The interesting thing is, we make commitments and actually expect to fail. This happens again and again, followed by similar justifications and phrases of self-assurance that “tomorrow is a new day”. But the more times we fail, the more guilt we feel, until finally, we give up on our resolutions altogether. Why does this happen? How do we explain this disappointing nine in 10 failure rate? According to Arnold, this has a lot to do with the resolutions themselves. When we make resolutions, whether at the end of every year or when we decide that it’s time for a new season, we tend to make large ideal statements that are hard to translate into achievable and do-able tasks. They are more like “wishes in disguise,” she writes, which often translate into a commitment that demands an overwhelming amount of changes. “I will be more assertive,” for instance, is essentally the wish that you “weren’t such a doormat”. This entails a whole list of mindset and behaviour modifications which has more of a paralysing rather than a motivating effect. According to Arnold, we need to make “microresolutions”. These are strategic, targeted commitments that specifically address a behaviour. They are small, achieveable tasks or commitments integrated into our daily lives. They “succeed every time” and are sustainable as a result. So instead of saying “I need to be more organised,” Arnold suggests identifying one specific action you can take that relates to being “organised”. For instance, if you’re disorganised in the morning and find that you lose time searching for your car keys, buy a basket for your keys and place it by the door. Whenever you return home, the car keys must go into the basket. Master this one specific action and it should eliminate all further frantic searches for keys. One small specific behavioural change like this will mean you are one step closer to the overall desire to be “organised”. If you’re constantly losing pieces of paper that you write notes on at the office, Arnold suggests buying one notebook and committing to write all your notes in that book. This way, whenever you need to retrieve any notes, you know where to look. If it sounds far too easy, that’s because that is the point. Microresolutions should be so easy to do that it becomes very very difficult to fail. Importantly, like the examples above, microresolutions focus on doing rather than being. Actors too use this approach when they prepare for a role. If someone wants to be more receptive to feedback, for example, they will focus on actions that such a person will take. One do-able thing they can commit to doing is to ask his/her superior for feedback after every presentation they make. One core strength of microresolutions is that they rely as little as possible on a person’s self control. Arnold explains that in making resolutions, we often make the mistake of overestimating the strength of our willpower. We say something like “I want to be fit,” and believe that self-control will help us leave work earlier, get to the gym and eat better. We think we can instantly transform because our willpower will drive us to the intended destination. The bad news is that we have a limited amount of self-control, and it is a “psychological resource that is easily exhausted”. In the book, Arnold quotes researchers Mark Muraven and Roy Baumeister in a 2000 study on willpower, saying “We found that after an act of self-control, subsequent unrelated self-control operations suffer… After resisting temptation, people perform more poorly on tests of vigilance and are able to resist subsequent temptations”. In other words, an approach that relies heavily on willpower isn’t sustainable. After one act requiring a significant amount of willpower, our self-control tires and we revert to our norms, which are our zones of comfort. People operate on unconscious habits, or “autopilot,” a lot more than we think. Just consider our morning routines. We move from one task to the next without thinking about it. Some of our habits are positive and some aren’t, but the main point is that we unconsciously do them. Our bodies prefer routine and when we disrupt routines, we will encounter resistance. So resolutions fail because we’re constantly fighting our urge for the familiar. We become tired, stressed and feel an intense urge to revert to our usual habits, which is our comfort mode. Microresolutions work because they cooperate with existing norms and work their way quietly into our system of habits. They need little willpower. Microresolutions should be easy to keep, such as committing to walk up the stairs after Friday lunches instead of taking the lift. A microresolution is an explicit commitment, not a desire or wish. It is a specific behavioural action that doesn’t require a significant amount of thinking. A resolution like “I will get more sleep” isn’t specific enough and difficult to enforce. “I will not use the mobile phone after 11pm”, on the other hand, is something explicit and measurable. Since they are simple and measurable, microresolutions provide immediate wins. “I will not be forgetful” sets a finish line that is far away. However, if the commitment is to always place car keys in the designated basket upon arriving home daily, every time that is done, that is a victory. Microresolutions must be tailored according to each of our current habits. Two different people may have different reasons for constantly being late for meetings. For example, Adam’s difficulty with punctuality in the mornings may have to do with rushing to prepare lunches for the family in the morning. So in his case, he could make a microresolution to prepare lunches on the previous evening instead. Like we earlier established, humans have an innate preference for norms and the familiar. To ensure easy follow-through, microresolutions should latch onto our existing habits. By linking them to something we always do everyday, this designates a clear time and place for the action. For example, if the commitment is to write a to-do list every morning, if Michelle usually checks emails as soon as she arrives at the office, her microresolution can be to write a to-do list before checking emails in the morning. We shouldn’t make more than two microresolutions at a time. It is better to pick one and make sure we constantly do it, than to select five and find it hard to follow through on all. Remember, simplicity and “sure-wins” are very important. If you’re wanting to see improvements in your life in a certain area, such as organisation or punctuality, try making a microresolution. It could be committing to get both first names and last names when you add someone new to your contact list. Or it could be to reduce one-hour meetings to 50-minute meetings. Since reading Arnold’s book, I’ve made one microresolution to help me get more sleep, and it has been surprisingly effective. Like she says, if you frame it specifically and customise it to your current habits, it is hard to fail. Small Move, Big Change by Caroline L. Arnold is distributed by Penguin Books and is available at all leading bookstores. Click here for more book reviews. Do We Always Need To Know It All?